He also wrote original screenplays, most notably “The Out-of-Towners,” “Murder by Death” and “The Goodbye Girl,” but always felt more comfortable with theater… “I’m writing for posterity with plays.” His characters were often called the voice of the silent majority, the “frustrated, edgy and insecure” elements that became his trademark. Much of this style had a basis in his difficult childhood, where he acknowledged he wanted to laugh himself out of the pain. His final original screenplay was appropriately “The Odd Couple II” (1998, with Jack Lemmon and Walter Matthau reprising their roles from the original film) and his last stage play was “Rose’s Dilemma” in 2003. If the universe were going to put one show/movie on Neil Simon’s tombstone, it would most likely be “The Odd Couple.” Thanks to the film adaptation of the 1965 play (and the subsequent TV show spin-off) the names “Felix” will always describe the neat and fussy, and “Oscar” will also describe the hopelessly messy. 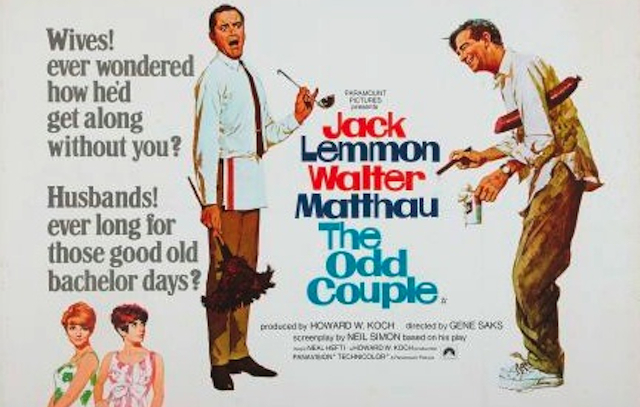 In the 1968 film, Jack Lemmon was a perfect Felix Unger and Walter Matthau practically was Oscar Madison (he originated the role on Broadway). Directed expansively by Gene Saks from Simon’s screenplay, the rat-a-tat patter and absurdist jokes still land beautifully, and the story is weird enough to last through multiple viewings. If an actor ever has to do a Neil Simon work, get thee to “The Odd Couple,” and understand what comic rhythm is all about. 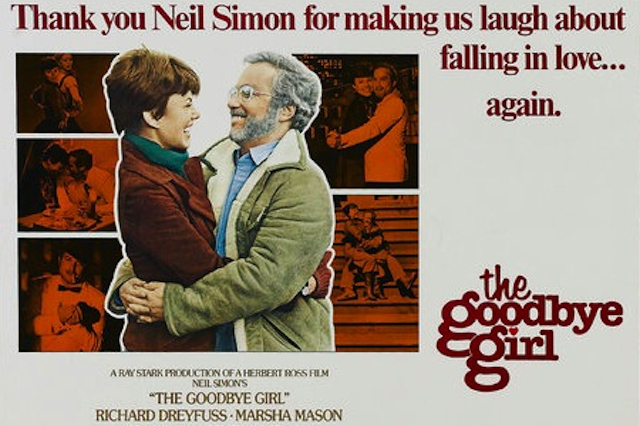 Neil Simon’s “The Goodbye Girl” displays the qualities that both made him a household name – his name is actually above the title – and led future generations to regard his steady comic patter as something almost passé. Simon knows how to milk a good premise and provides safe, middlebrow entertainment even when his characters exhibit actions and attitudes that wouldn’t pass muster today. While much of The Goodbye Girl has not aged well… its attitudes about the theatre are particularly cringe inducing… Richard Dreyfuss, Marsha Mason and little Quinn Cummings have a field day with Simon’s steady patter. The three of them dig into this Odd Couple like relationship of down-on-his-luck egotistical actor Elliott, penniless single mother Paula and her wise-beyond-her-years 10 year old daughter Lucy for the heartstring pulling laughs Simon specialized in, and it somehow works. SIMON-IZED: LUCY: I smell strawberries burning. PAULA: That’s incense. LUCY: What’s incense? PAULA: It is what I’m feeling right now. Neil Simon’s complexity is often seen through his work, especially when he perfectly blends the comedic with the dramatic. 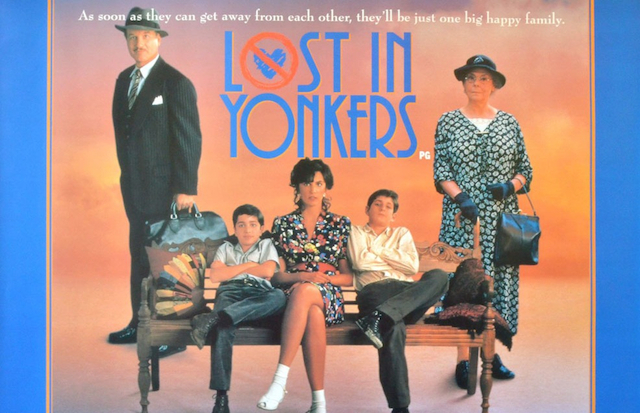 “The Odd Couple” may easily be his most identifiable piece of work, but “Lost in Yonkers” is his magnum opus. Based on the play that earned him a Pulitzer Prize, this film utilizes the teenage boy’s gaze as our lens through this family drama. Simon shows his deft hand at crafting something humbly affecting with something humorous and sweet. Sort of like he did in “The Odd Couple” – but one step further – by also including the female perspective. This movie version is served well by the fact that many of the performers in the film came from the play, creating fully fleshed out characters. Although the film’s focus is deceptively on the males, it’s the females that steal the spotlight. Actresses Mercedes Ruehl and Irene Worth (perhaps accidentally) became the focus of this film, and that is likely due to the fantastic job Martha Coolidge does as director. SIMON-IZED: Uncle Louie, played by Richard Dreyfuss, has a candid conversation with the teenagers about life and his place in it. This scene highlights the corrupting force he is, coming off as sweet, caring and funny, but proving to be a potentially bad influence. This juxtaposition is the very epitome of the crisis of conscious we go through as adults once we start to think for ourselves. Source material for this article is from Wikipedia. 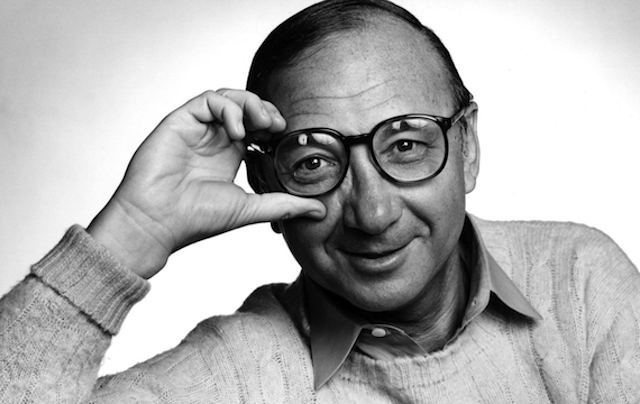 Neil Simon, the Court Jester of Broadway, 1927-2018. All films available on DVD/Blu-ray and digital download.